A device that enables an aircraft pilot to view the instrument panel while looking out the cockpit window, by projecting an image of the panel in the direction of the window and forming the image at infinity. A display of flight, navigation, attack, or other information superimposed upon the pilot's forward field of view. Most HUDs permit the display of selective information for various modes of operation of the aircraft. 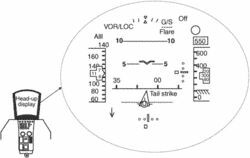 For example, on takeoff, all flight parameters required by the pilot for takeoff will be displayed; the information displayed during navigation, attack, and landing will be different.